Look over or stand on the fortified walls of the medieval city of Mdina to see panoramic views of Malta. The views are especially good from Bastion Square. 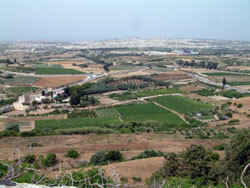 The Mosta Dome can be seen in the distance left of centre, the cultivated patchwork of fields and built up areas. Click on the photograph on the left for a larger image. 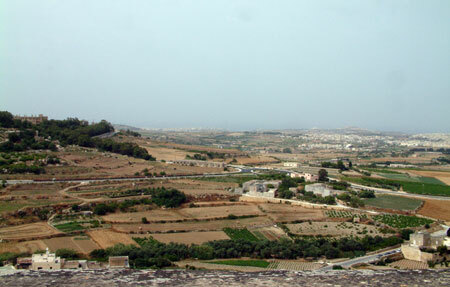 Similar views of almost the whole of Malta can be seen from various vantage points on the walls of Mdina. Take a camera to capture the white coloured towns shining in the sun and various landmarks.